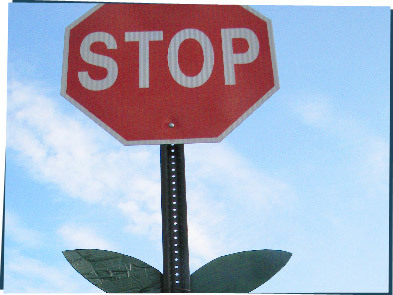 Remember when we found this mysterious leafy stop sign? I think our friends have figured out what it means! Stop sharpening pencils just to be sharpening! Use them until the lead becomes stubby and then sharpen! Oversharpening wastes the "lead" and limits the pencils life! i think we should stop people from driving speedboats where manatees and dugongs live. So every time you stop at a stop sign, use those 5 seconds to think about the oversharpened pencils, flowers, and manatees of the world that need your help! And then, stop stopping and go do something about it!